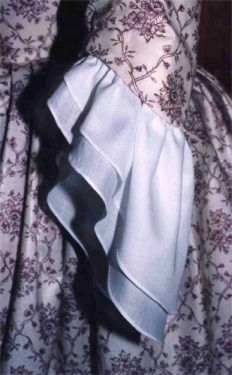 If the garment is missing a major element or accessory, reproductions can be made for display purposes to fill in the missing context. Reproductions can also be made for actual wear by visitors or first-person interpreters. 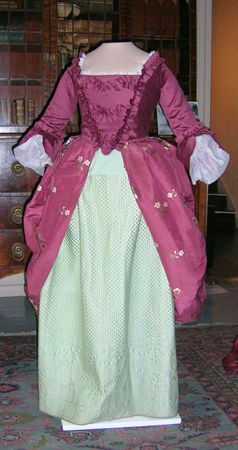 18th c. dress with original skirts partially reconstructed for display, and reproduction bodice for context. Courtesy of Moffat-Ladd House, Portsmouth, NH. The client wished to show the fabric in its original context. 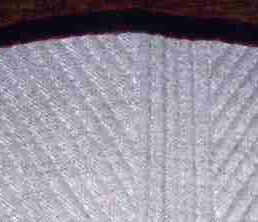 Of the original garment, only a small portion of the skirt remained as a flat panel. Not only was a large hole cut into the fabric, but after examining seams and following existing fold lines from the original pleats at the waist, it was clear most of the skirt was missing as well. 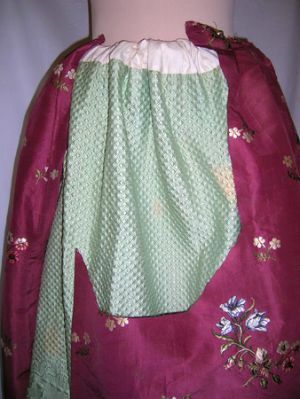 To disguise the hole and the lack of fabric, the skirt was displayed in a Polonaise style over an 18th c. quilted petticoat provided by the client. 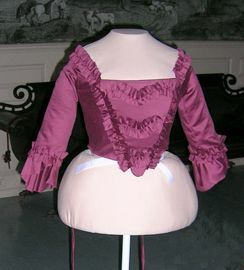 For context, a reproduction bodice was made in a fabric that fit the skirt's color, but was clearly not original, to help set it apart as new. 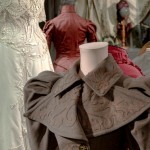 Similarly the sleeve ruffles and neck ruffles were made of tissue paper rather than fabric to help mark them as parts of the display rather than as historic elements. The mannequin’s hips were carved to support the skirt in the correct shape. Reproduction hand-stitched cotton batiste cuffs for 18thc. dress. Detail, reproduction hand-stitched linen and cane 18th c. stays made for visitor handling.